Hey there! 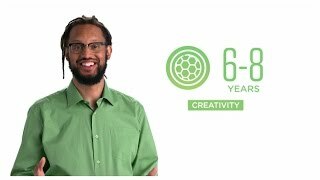 I’m Stephen Brackett, bringing you the Colorado Early Learning and Development Guidelines’ video for 6-8 years … Creativity! At this age, many children are really expanding their creative interests! Expose your child to a variety of art forms. Explore how the arts appear in their everyday life, like all the different kinds of music you can find on the radio, or the colors, shapes and materials they see every day. Write or make up stories together. You can start a story and let them child finish it or take turns. As you go about your day, talk about things you see that seem like “art” to you. And encourage them to get involved with some sort of creative group or activity, such as band or painting murals to make your community brighter. The “arts” are all around us. The trick is to help your child open their eyes to see it. Whether it’s music or architecture or the beauty of words, when you expose a child to art, you open up a whole new world of learning and connection that will last a lifetime. If you’d like more information on what to expect from your 6-8 year old, check out the Colorado Early Learning and Development Guidelines website at www.earlylearningco.org, where you can download the guidelines, find links to more resources and watch more of our videos. And remember… all children learn, grow and develop differently. If you’re concerned about your child, talk to your pediatrician or your pediatrician. Hey there! 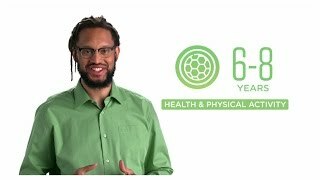 I’m Stephen Brackett, bringing you the Colorado Early Learning and Development Guidelines’ video for 6-8 years … health and physical activity! Showing more respect for their peers. Recognize their efforts to work well with others. They’re still at the age where effort is as valuable as outcome. Hey there! 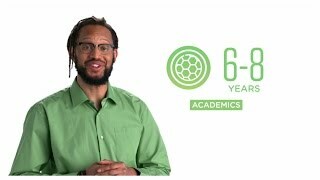 I’m Stephen Brackett, bringing you the Colorado Early Learning and Development Guidelines’ video for 6-8 years … Academics! At this age, most children are prepared to start learning in a more formal setting, like a classroom. Physical, social and mental skills develop quickly at this time. Younger children are learning the basics of reading by identifying letters, recognizing sight words and how words work together to help you share ideas. First through third graders are usually starting to read on their own, and are able to talk about what they read. And all ages are starting to understand the world at large, such as how plants grow, how numbers relate to each other, and recognizing that different cultures may have different rules and languages than they do. Read with your child and take interest in what they are learning in school. Show them how you use lists and numbers in your daily life, like setting a budget or making a grocery list. Many museums, planetariums and other cultural spots offer free days. Take advantage of them! And finally, chat with your child about why they think that history, science and the arts are important. A child’s ability to think critically and work well with others is what Colorado educators call 21st Century Skills…. Skills that will help lay a strong foundation for your child’s future. By learning about Colorado’s Early Learning and Development Guidelines, you are playing a big role in getting your child off to a great start. Good job! To learn more about what most kids are doing from 6-8 years old, check out the Colorado Early Learning and Development Guidelines at: www.earlylearningco.org. Hey there! 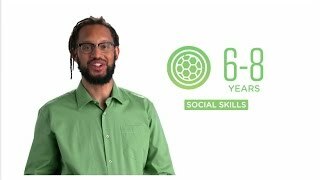 I’m Stephen Brackett, bringing you the Colorado Early Learning and Development Guidelines’ video for 6-8 years … Social skills! At this age, most children are ready for a little more independence when it comes to their social lives and interaction outside of the family. Continue to lead by example! It can be a little surprising when you realize that your child is becoming an independent person. The key thing to remember is that when your child feels loved and encouraged, they also have a solid foundation to build on in the future. Good job! To learn more about what most kids are doing from 6-8 years old, check out the Colorado Early Learning and Development Guidelines at: www.earlylearningco.org. Most importantly, if you feel you child isn’t hitting some of these goals then please… call your pediatrician or your child’s teacher. By working as a team, you can help your child can get all the support he or she needs. As in the earlier years, kids’ thinking, feeling and growth will continue to develop, but as they transition from preschool into kindergarten, their learning will be more formal and focused on academic subjects. These formal school subject areas are categorized in Colorado’s Academic Standards. It’s important for kids to eat well, get enough sleep, and exercise to stay healthy. Kids will develop their ability to move during a variety of routines, games, and activities. Kindergarteners should show respect for themselves and others and follow directions. First grade students grow in their ability to effectively work with others, including following the rules. In second and third grade, children continue developing social skills so that they can work well with other students in class. Students learn about other cultures – their language, interactions, and cultural products. Students begin to learn how to communicate in a foreign language. Students connect their experiences to the language they are learning. Learning a new language and about a new culture helps students to learn more about their own culture and experiences. Students are learning how to speak and understand the language(s) spoken around them. Students begin to read. While preschool and kindergarten children learn the basics of reading (letters and phonics), children in first through third grade begin to read on their own. In preschool, kids learn that writing means something and communicates ideas. Students begin to print upper and lower case letters and add spacing between words in kindergarten. In first through third grade, students learn to write with more structure to tell stories and give messages. Students begin to gather information, answer questions and solve problems. Students learn about numbers and how they are related. Students learn how to think though and solve math problems. Students learn how to recognize, describe, and compare shapes, objects and structures. Students begin to use data to answer questions. Students learn about physical science and changes in matter and energy. Students learn about living things and how they interact with each other and their environment. Students learn how Earth’s systems function and interact with other objects in space. Students learn about historical people and events, which helps to develop moral understanding and comprehend how things change. Students learn about world regions and resources and how places are connected locally, nationally and globally. Students learn about economics and personal finances. Students learn about government, citizenship and law. Students learn how to express themselves in response to music, for example, by singing songs. Students learn how music has a different language and structure. Students develop the knowledge to evaluate and critique music. Students develop the confidence and skills to dance and perform. Students learn how to create dance elements and translate ideas through movement. Students learn about the history of dance. Students learn how visual arts can help someone express themselves and communicate with others. Students learn how to critique art. Students learn how to create art with different techniques and using different materials. Students understand how visual arts can be a part of lifelong learning. Students learn how to create and participate in theater, including performing in and writing plays. Students develop the skills to critique theater and identify elements of theater in their everyday life. Collectively these areas reflect all that a student will learn in school, but there are also other important areas of child development including their overall health, feelings and emotions. Students will also continue to develop important skills that will help them be successful in life. Colorado calls these 21st Century Skills and they include, but are not limited to, students’ ability to think critically and work well with others.